Ukrainian border guards got in a fight with a group of terrorists. 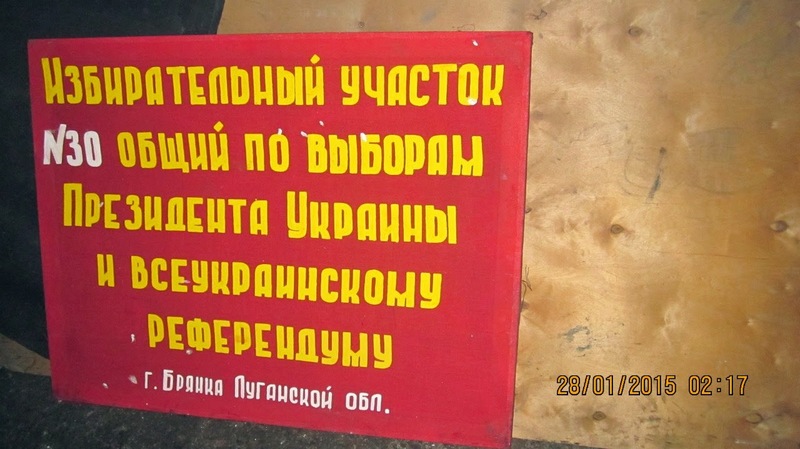 Last night border guards of “Tryokhizbenka” unit in Lugansk Region spotted terrorists saboteur group. This happened on the demarcation line between ATO forces and illegal armed groups. 6 terrorist were located with the help of thermal imager, they were moving in the direction to Tryokhizbenka village. 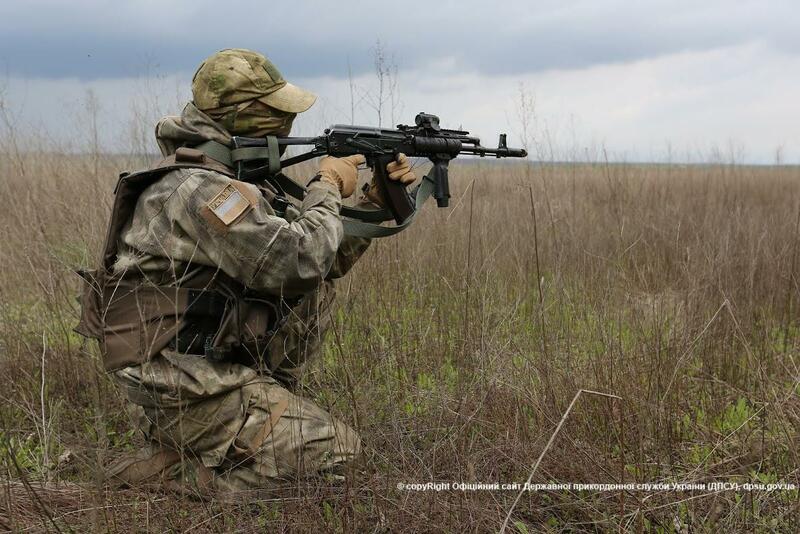 In order to stop saboteurs border guards together with Ukrainian military opened fire using automatic weapon and automatic grenade launcher AGS-17 at the positions of armed terrorists. 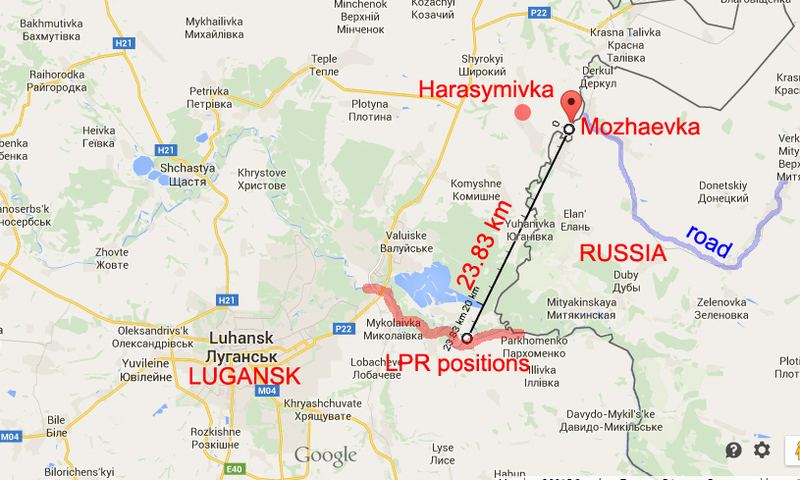 Terrorists had to retreat behind the demarcation line in the direction of Krasniy Liman town. The demarcation line in that area goes along Siverskiy Donetsk River. 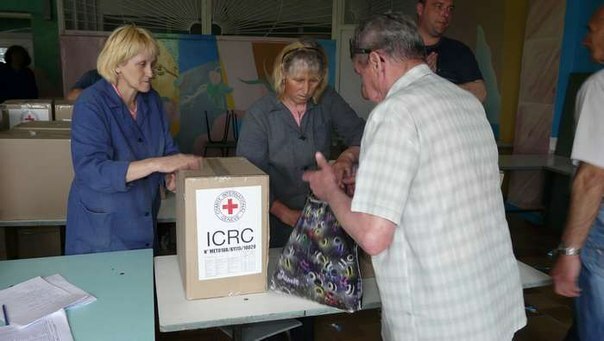 ICRC delivered 116 tons of humanitarian aid to Stakhanov located on occupied territory. 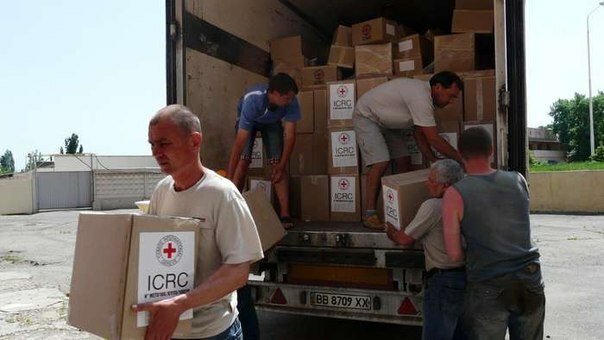 On May 26 International Committee of Red Cross delivered 116 tons of humanitarian aid to Stakhanov, the city is under control of so-called Lugansk People’s Republic and located 63 km from Lugansk. That aid will be distributed among over 5500 people who need it. People got food packages that should be enough for one month. Each package contains flour, cereals, canned foods, salt, sugar, tea and sunflower oil. 70 children of local boarding school also received this humanitarian aid. 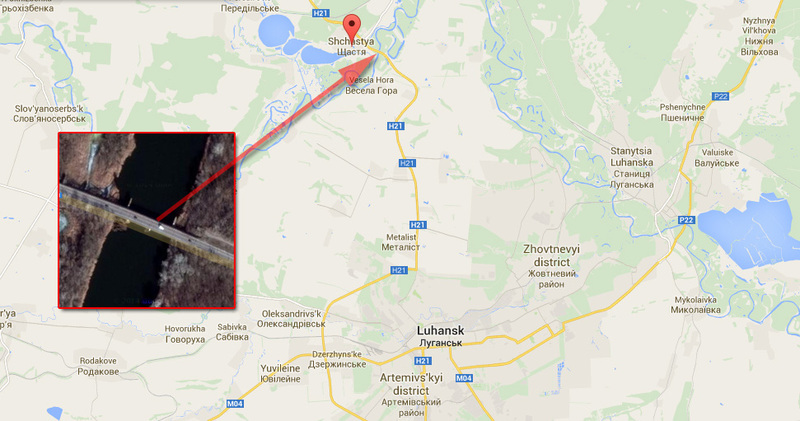 Massive terrorist attack prevented in Stanytsia Luhanska located on demarcation line. 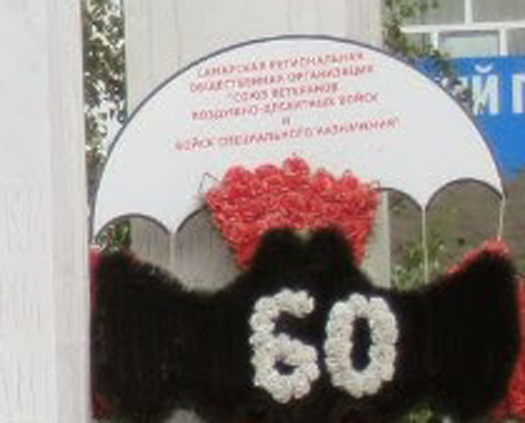 Yesterday, May 28 2015, a terrorist attack was prevented in Anti-Terrorist Operation (ATO) zone, Sector A. Russian mercenaries tried to commit mass murder of civilian people in Stanytsia Luhanska that borders with the territory of Lugansk Region controlled by pro-Russian rebels. Military counter-intelligence unit of Security Service of Ukraine got information that terrorists were planning to blow up a bomb near the building of Pension Fund in Stanytsia Luhanska. 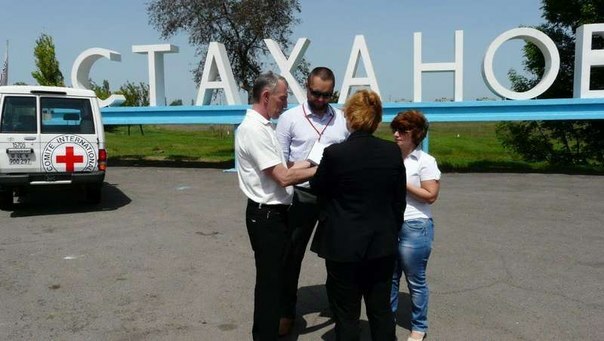 They planned to do it during the meeting of people who wanted to protest against the order to close the traffic via destroyed bridge that connects Ukraine controlled territory and the territory controlled by so-called Lugansk People’s Republic. The passage was closed by the order of Hennadiy Moskal, the head of Civil-Military Administration of Lugansk Region. Dozens of civilian people could be killed in that terrorists attack and that would destabilize situation in the region and would spread separatist ideas among the population. Military counter-intelligence unit together with military special forces unit “Zahid” located the bomb and neutralized it. Military who took part in the operation said that the bomb was made by professionals, artillery shell 120 mm caliber was connected to radio-detonator that could be activated remotely at any moment. – Special Forces officer, who took part in the operation. Military counter-intelligence service reported that they started criminal investigation according to “Terrorism” article. “Royal Flush”. Russian Special Forces soldier fighting in Ukraine showed us all! 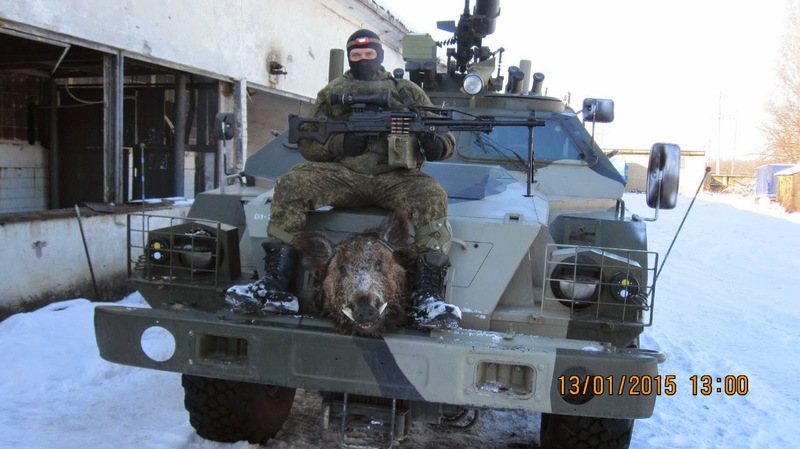 At the end of January Ukrainian investigative team of InformNapalm.org found profile of a Russian soldier who was fighting in Ukraine on the side of so-called Lugansk People’s Republic. His name is Krivko. That guy really gave us all possible proofs of Russian aggression against Ukraine posting photos of all his steps in Ukraine. 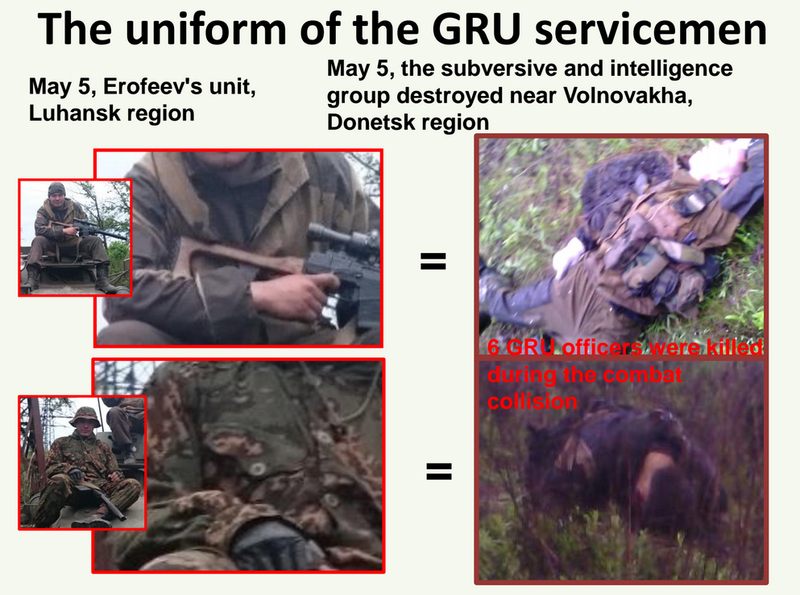 Here is a brief summary of what that guy showed us, so everybody can see who is really fighting against Ukrainian Army. 1. He is Russian citizen. 3. He took part in attack on Lugansk Airport on August 31 2014 when Russian Army totally destroyed and captured the airport. He was on a training camp inside Ukraine on the territory controlled by so-called Lugansk People’s Republic just 8km away from Lugansk Airport and posted photos from there. 4. 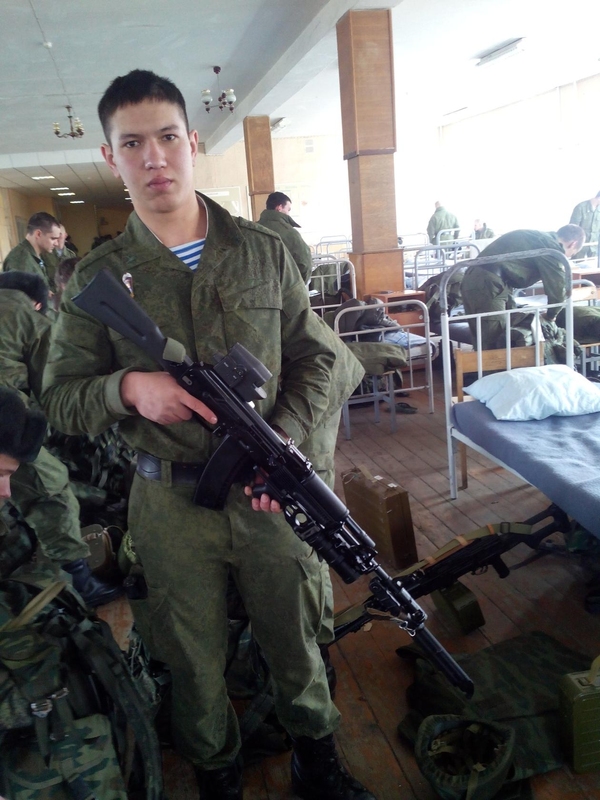 He got AS “Val” assault rifle, manufactured in Russia only and used by Russian Special Forces unit. 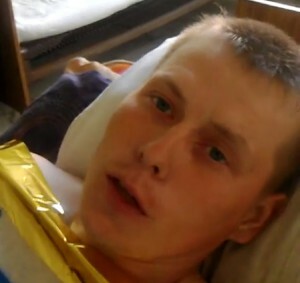 And he was wounded in a battle against Ukrainian Army near Sanzharivka on Jan 28 2015. 5. He is driving armored personnel carrier BPM-97 “Vystrel” manufactured only in Russia and used only by Russian Special Forces units. IMPORTANT UPDATE. 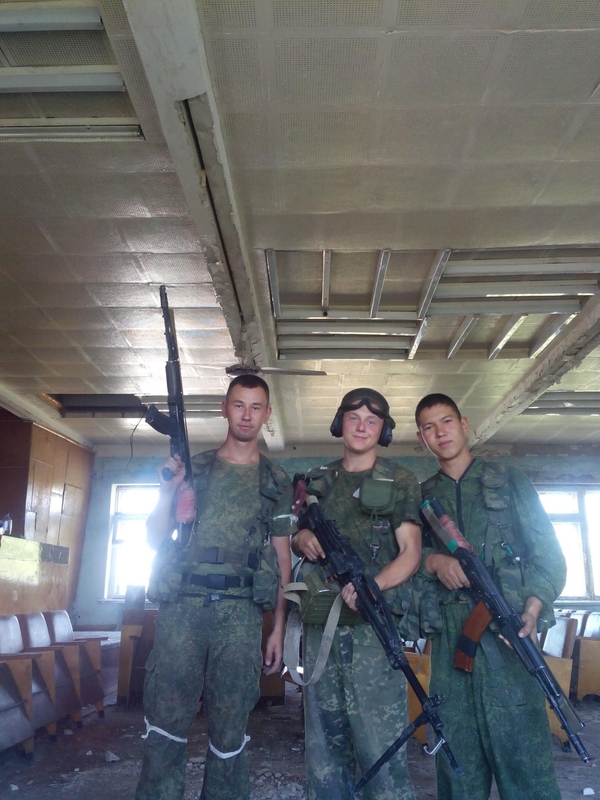 We found video with this Russian soldier Krivko made by Graham Phillips, he uploaded that video to his Youtube channel on September 5 2014. In the video he interviews people who he calls Novorossiya militia. The location where he takes video is the territory of Lugansk Airpot (see out post about that video dated September 6 2014 http://lugansk-news.com/video-of-russian-soldiers-fighting-in-lugansk-ukraine/). The airport was lost on August 31 2014. Krivko is the guy in tactical glasses. Here is screenshot from the video and another photo he posted on his page later. You can see that he wears same hat, and other things like radio and bags are adjusted identically on him in both photos. 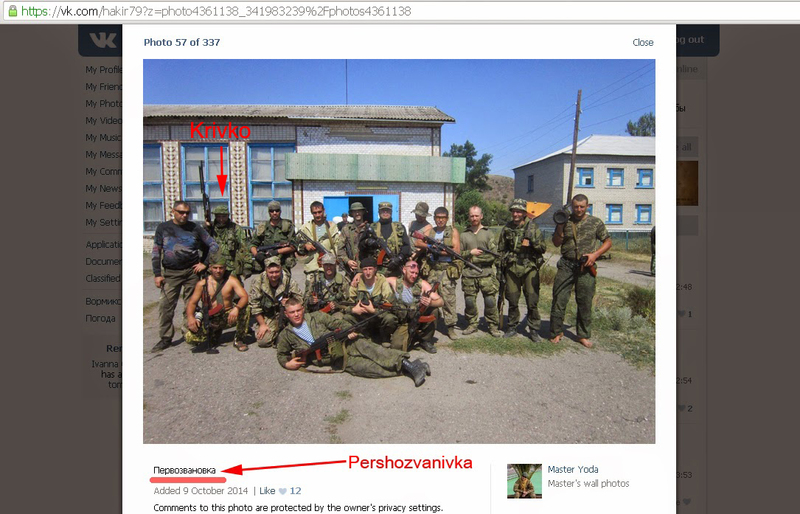 The photo was taken in Pershozvanivka village (it has geo-location mark), at that time it was on terrorists controlled part of Lugansk Region. 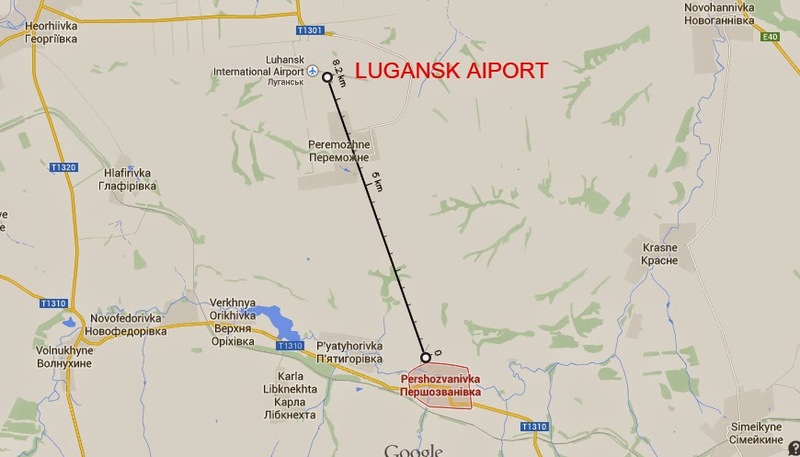 The village is locate about 8 km from Lugansk Airport and obviously it was used as some kind of training camp by Russian units when they prepared attack on the airport. 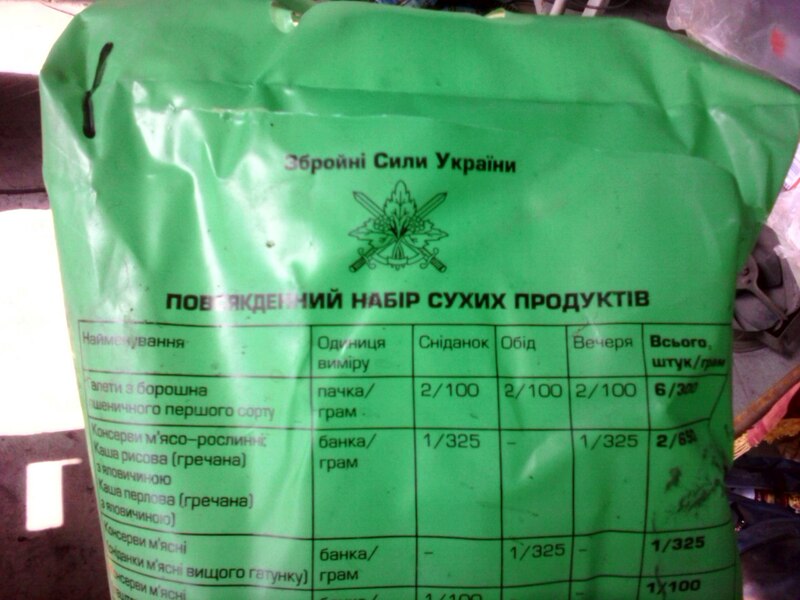 On the same day when he posted a photo from Pershozvanivka village (added on September 22, but obviously taken earlier) he posted photos of Ukrainian and USA MRE packages that his group obviously got from the positions of Ukrainian army they took or from Ukrainian POW they captured. 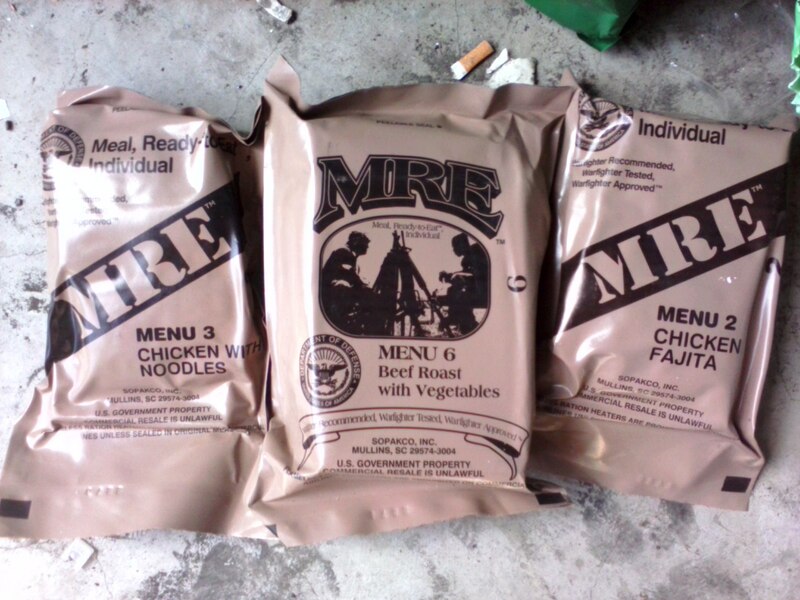 It’s not a secret that Ukrainian soldiers who defended Lugansk Airport had USA MRE. Other photos from the same location were posted on October 3 and October 9 2014. Some photos had interesting comments, but Krivko closed them for public. 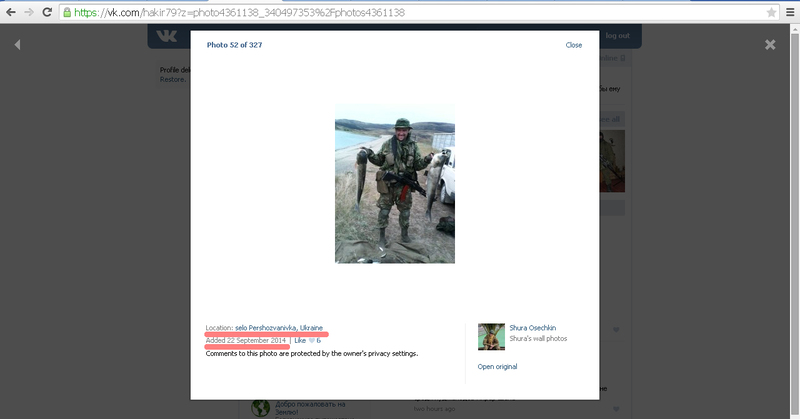 Still the screenshot of some of his photos before he changed security settings of his profile are available here www.psb4ukr.org On a screenshot taken on November 1 2014 you can see his comment added on October 3 when the photo was uploaded “Half an hour before storming Lugansk Airport”. Russian military training camp in Pershozvanivka, Lugansk Region, Ukraine. After the battle for Lugansk Airport it looks like he took some time of. He posts a lot of photos from Sochi, Russian Federation at the end of November and beginning of December. On January 2015 28 at about 3:30pm Krivko aka “Master Yoda” was wounded in a battle against Ukrainian Army near Sanzharivka, he was taken to the hospital in Stakhanov and posted few photos from there. 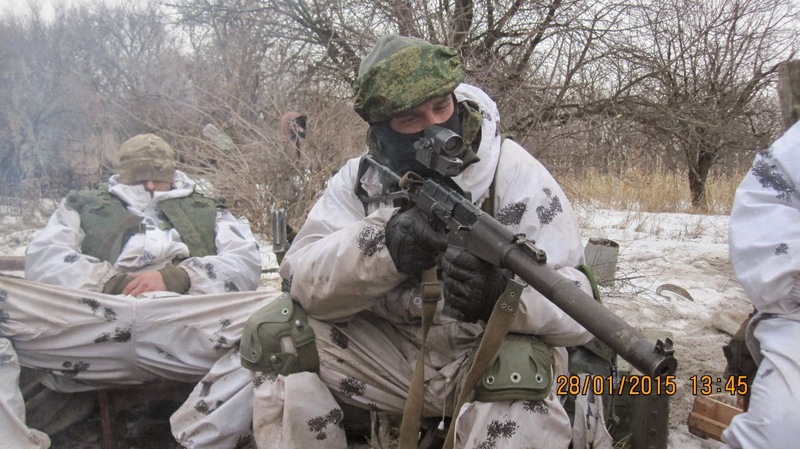 The photos below were taken just before the battle at 13:34 on Jan 28, and in those photos you can see AS Val assault riffle used only by Russian Special Forces units. Earlier that day Krivko was in Bryanka. He posted a photo taken there at 02:17am. In the photo is a plate from “Ukraine presidential elections” voting office number #30 of Bryanka city. In the evening the day he was wounded he posted a photo of the wounds. The time stamp in the photo is Jan 28 2015 20:40. Next day early in the morning he posted history written by his doctor in Stakhanov hospital. 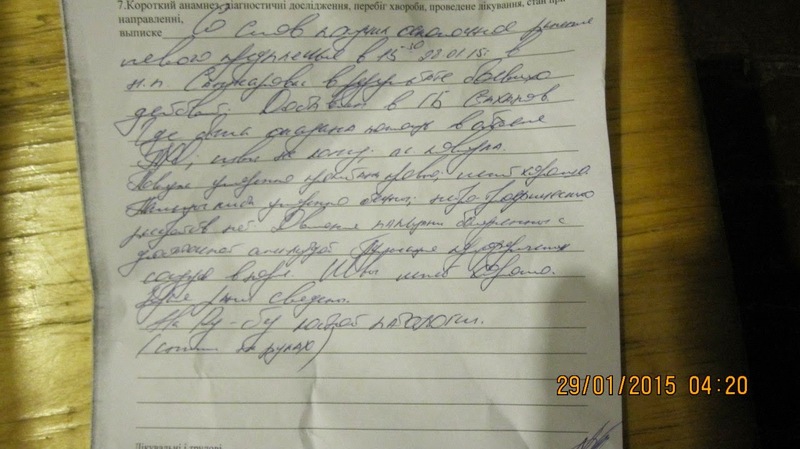 The document says that he was wounded near Sanzharivka during military actions at 15:30 on Jan 28 2015. The medical form is printed in Ukrainian language. Wounded near Sanzharivka during military actions at 15:30 on Jan 28 2015. There is also a photo that identifies him as a soldier of 3rd Brigade of Special Forces of Main Intelligence Directorate of the General Staff of the Armed Forces of the Russian Federation, aka Spetsnaz GRU. 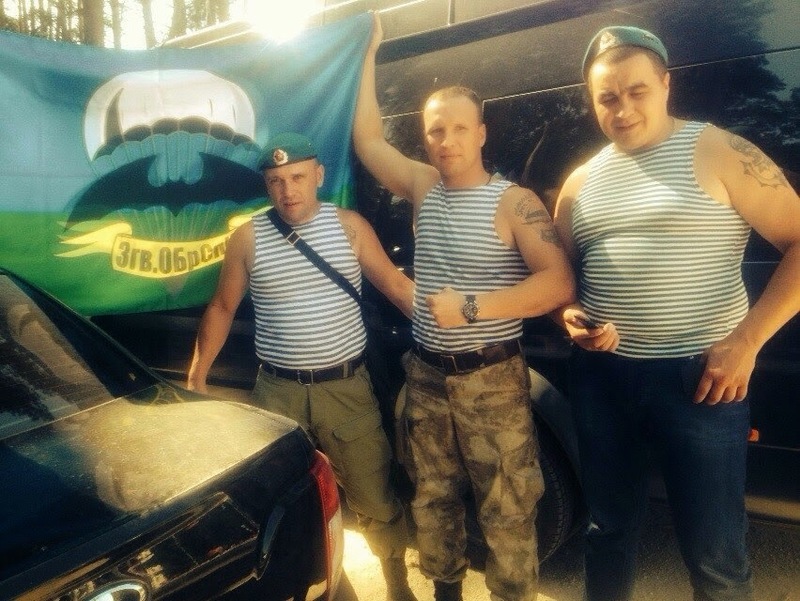 In the photo with his friends they are holding a flag, the letters on the flag is abbreviation of the full name of 3rd Brigade of Spetsnaz GRU. Obviously they had some kind of meeting in Samara, the soldiers who served in the same unit. And more likely they were recruited during that meeting and went to Ukraine to fight against Ukrainian Army on the side of so-called Lugansk People’s Republic. Here is a link to Google Map of the location where the photo was take that match the map behind the guys in the photo. Cease-fire? Number of attacks on Ukrainian positions increased. Military and civilian continue to die. After two Russian Special Forces soldiers were wounded and captured alive near Lugansk, the number of attacks on Ukrainian Army positions dramatically increased along the front line. Civilians and military from Ukrainian side continue to die everyday. Map of attacks on Ukrainian Army positions in the last 24 hours. Yesterday, starting from the noon and till today morning, cities and villages on Ukraine controlled territory located on demarcation line were intensively shelled with the use of different type of weapon. In Stanytsia Luhanska a private house on Lermontova street got destroyed and burnt after it got hit. Luckily nobody got hurt. The suburbs of Stakhanivets village, where Ukrainian fortifications are located, were shelled starting from 4am to 5:30am by 80 and 120 mm caliber mortars and also from a tank. The fire was opened from occupied Pervomaisk located 3km away from Stakhanivets. Just in 1 and a half hours about 460-480 mines exploded. No soldier got killed or wounded during that attack, residential area wasn’t damaged. Also yesterday at about 4pm Ukrainian checkpoint in Rodyna village was attacked with the use of automatic grenade launchers. 27 y.o. soldier from “Aidar” battalion was heavily wounded, he was taken to the hospital, but fortunately died after 2 hours after that. Also yesterday at about 9pm Popasna city was shelled by mortars. Today at about 4am residential area was shelled by mortars again. One of the mines hit residential building on Vorovskogo St. The house got on fire, the owner, 55 y.o. who was hiding in the basement died. Follow the “White Rabbit”. 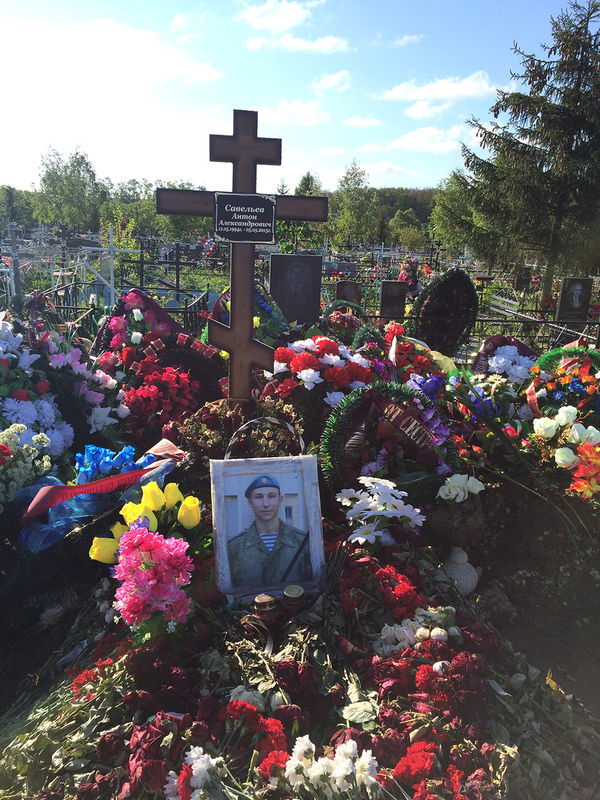 Graves of Russian Special forces “who are not there” killed in Ukraine. All three Russian soldiers found by Ruslan Leviev were in Ukraine. Their names are Timur Mamayusupov aka “Mamai”, Ivan Kardapolov aka “Kardan” and Anton Saveliev aka “Sava”. They were soldiers of the 16th Brigade of Special Forces of Main Intelligence Directorate of the General Staff of the Armed Forces of the Russian Federation, their military unit #54607 is stationed in Tambov city. There is a photo of Timur Mamayusupov taken exactly at the same location in front of APC with symbolic of so-called Lugansk People’s Republic. 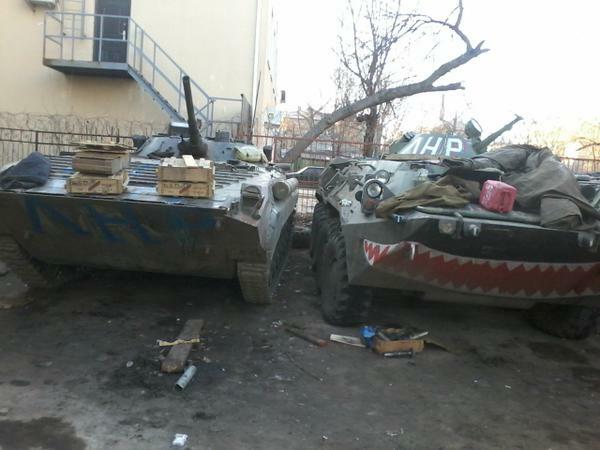 Here is a photo of the same APC also know as “Zubastik” (means Nibbler in Russian). You can easily see that all the photos are taken at same location… same tree, same metal fence, same beige color building. Here is another photo from the same place posted by us on April 8. Timur Mamayusupov with AK gun used by Russian Special Forces only. The photos that we already have and investigation by Ruslan Leviev had proved that Russian Special Forces units are in Lugansk. They take part in military operations against Ukrainian Army on the side of so-called Lugansk People’s Republic. They get killed, their bodies get transported to Russia and who knows how many graves are out there. Relatives refuse to talk about it. Below is a photo of Anton Saveliev aka “Sava” and Timur Mamayusupov aka “Mamai” taken somewhere in Ukraine. 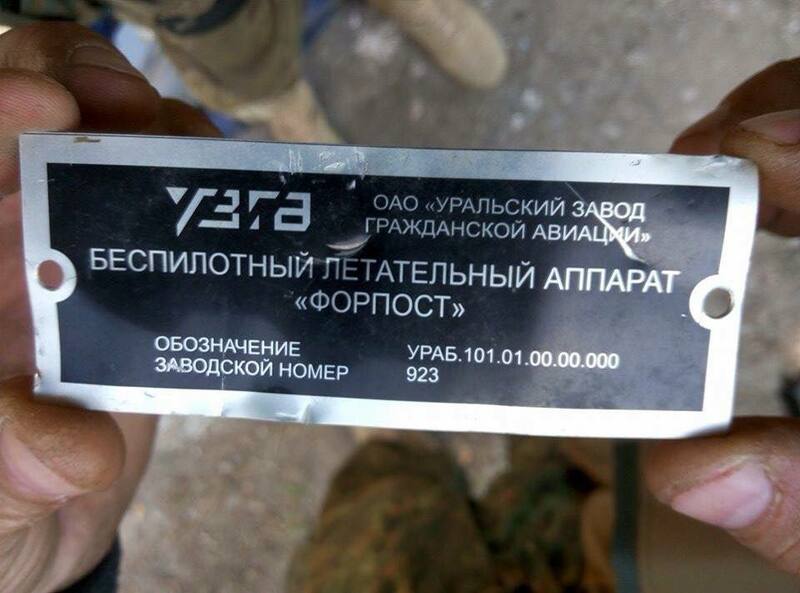 You can see white stripes that are used by Russian units in Ukraine as identification. Anton Saveliev aka “Sava” (on the left) and Timur Mamayusupov aka “Mamai” (on the right) somewhere in Ukraine. 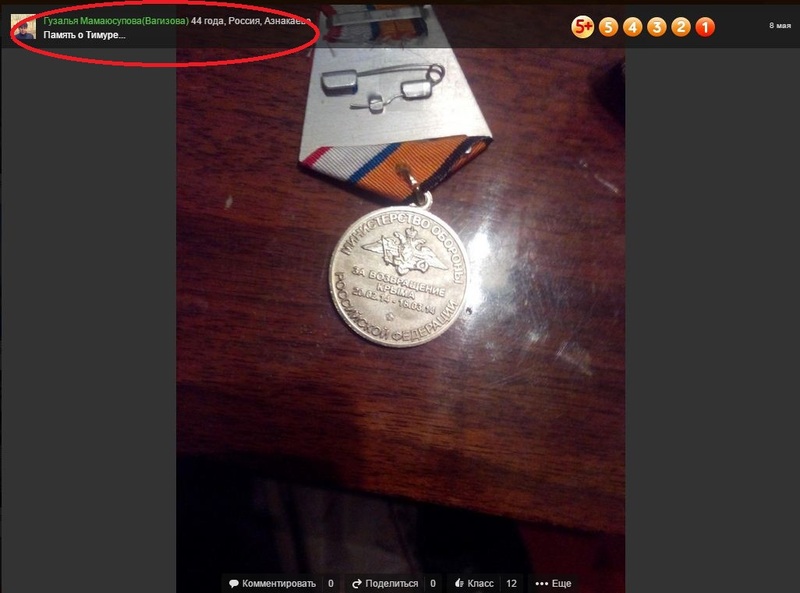 On May 8 2015 the mother of Timur Mamayusupov posted a photo of a medal that her son got for “Crimean operation”. 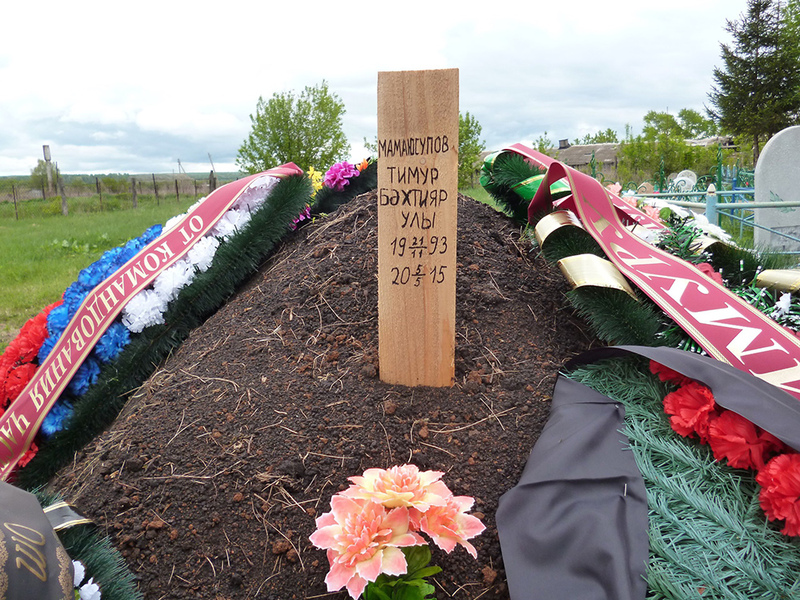 She put a tittle for the photo “Memory of Timur…”. After the investigation of her son’s death became public, she deleted her social profile. The words on the medal say “Ministry of Defense of Russian Federation. For return of the Crimea. February 20 2014 – March 18 2014″. 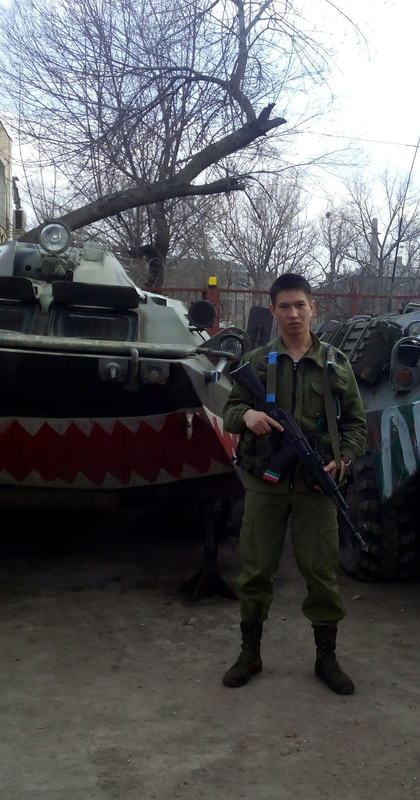 Obviously Timur Mamayusupov was one of those “green men” who Kremlin called “local militia” and denied they were regular Russian Army. 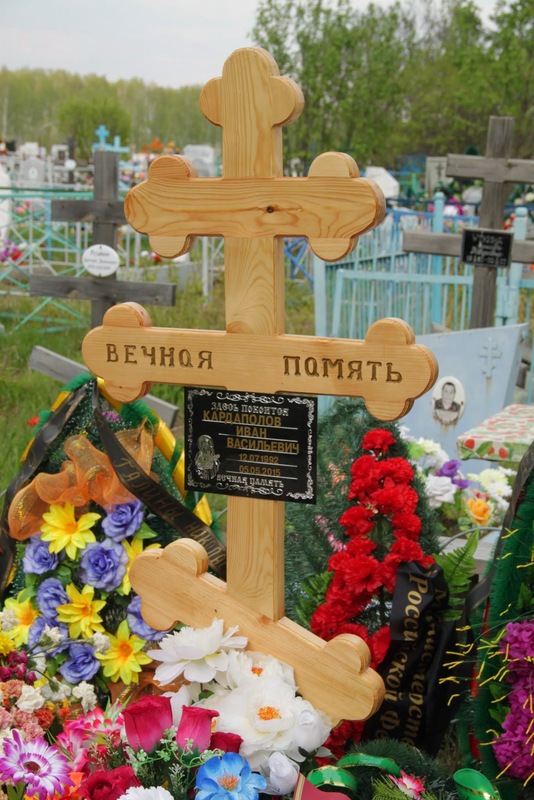 Below are other two graves found by Ruslan Leviev team. Terrorists resumed heavy shelling near Shchastya in Lugansk Region. Ukraine lost 1 WIA and APC. Last night and tonight Shchastya was heavily shelled by mortars and grenade launchers. Terrorists opened fire from the side of occupied Vesela Hora village and hit the area near the bridge over Siverskiy Donets River where Ukrainian Army fortifications are located. According to the information we have now, at least one armored personnel carrier (APC) was hit and one soldier was seriously wounded. Few country houses burnt out after the mines and grenades hit them. Power line was damaged, so the electric supply was switched to reserve line. One of the mine damaged gas pipe line, but repair team managed to fix it before the morning. Residential areas of the city was out of the zone that was under fire, all city infrastructure works. 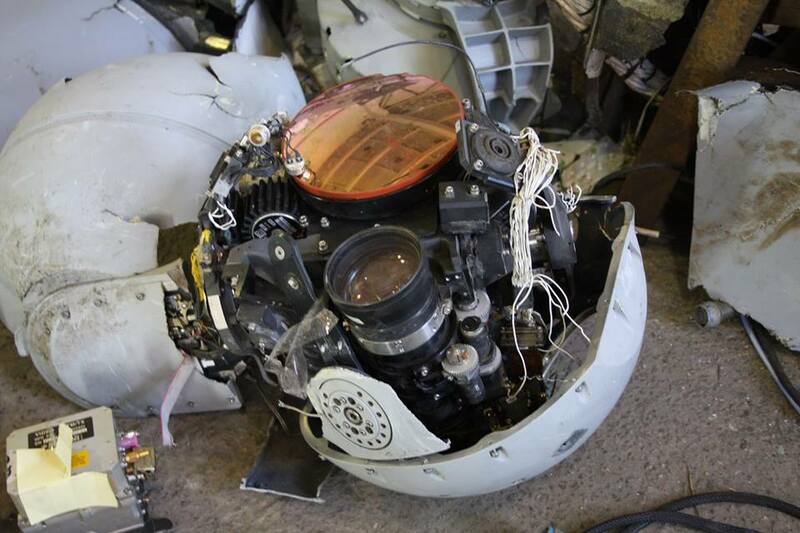 Ukrainian Army shot down Russian UAV FORPOST that costs 6 million USD. 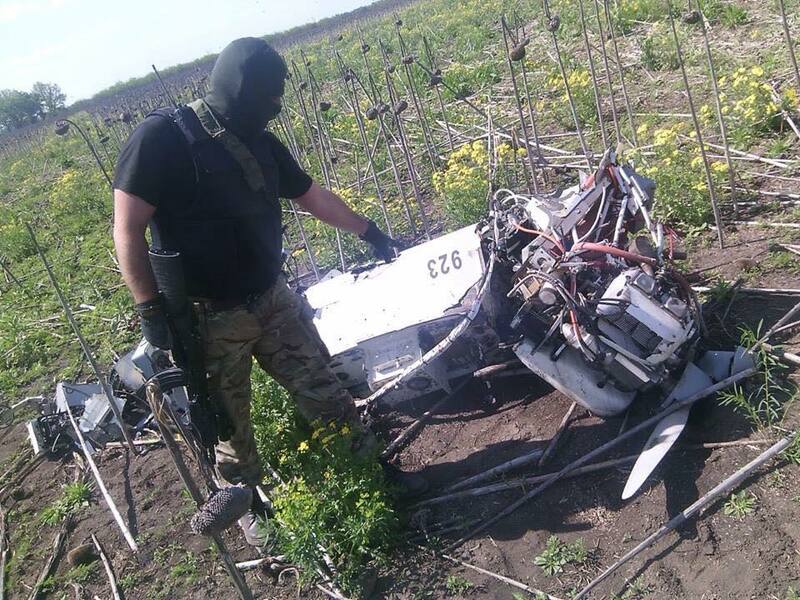 Press-Center of “DNIPRO-1″ Ukrainian Army Regiment has reported today that their soldiers managed to shoot down Russian UAV near Avdiivka in Donetsk Region. That was joint operation of their soldiers and the Center of Special Operations. 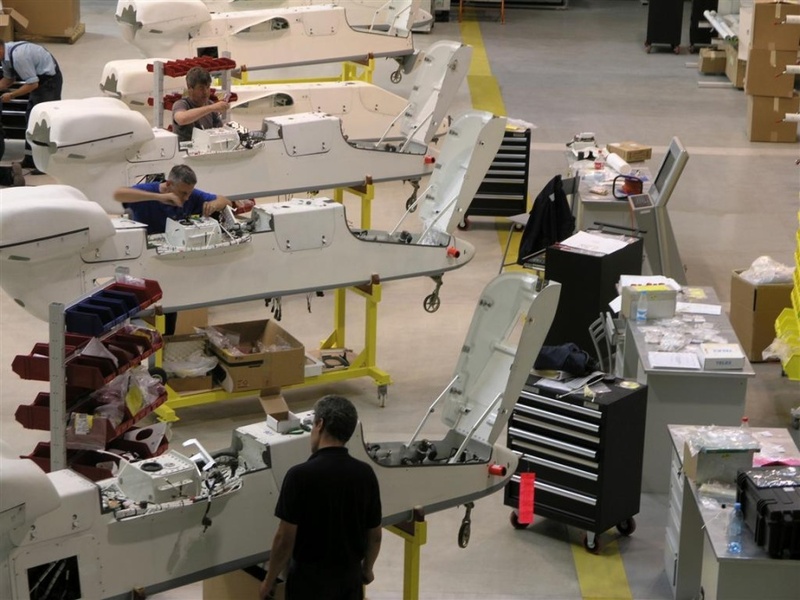 “FORPOST” UAV is one of the most expensive. It’s price is 6 million USD. 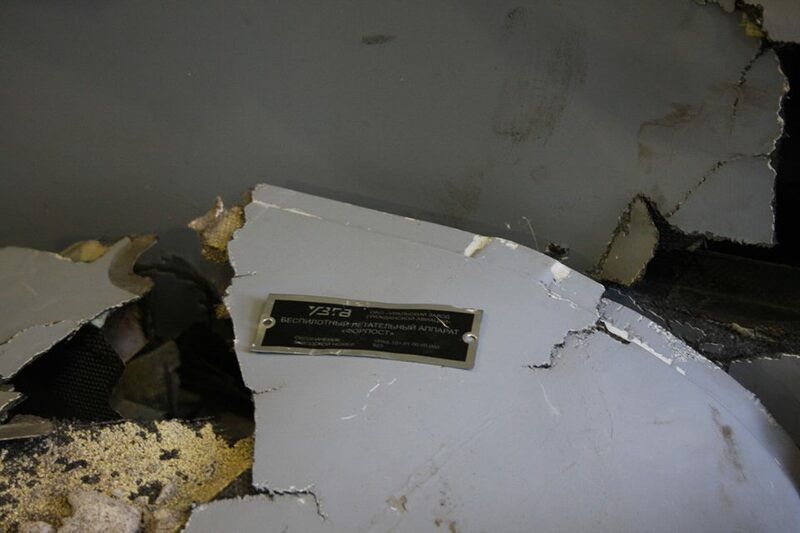 Later today Security Service of Ukraine posted a video of remains of this Russian drone shot down on the territory of Ukraine by Ukrainian soldiers. Ministry of Defense of Russian Federation had only 11 “FORPOST” Unmanned Aerial Vehicles. But after the successful operation of “DNIPRO-1″ Regiment they have less now. Right now the drone is located at the headwaters of Anti-terrorist Center. Specialists who deal with UAVs are working with it. 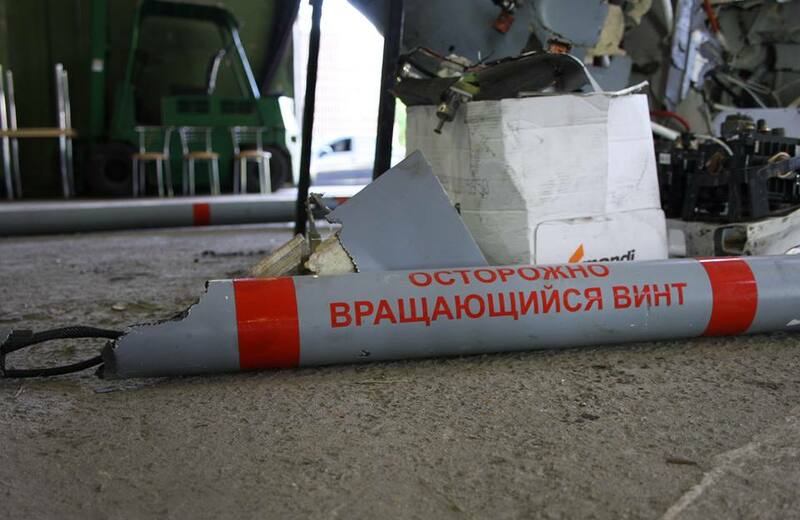 Russian “FORPOST” was shot down in the area of Avdiivka close to Vodyane village in Donetsk Region. 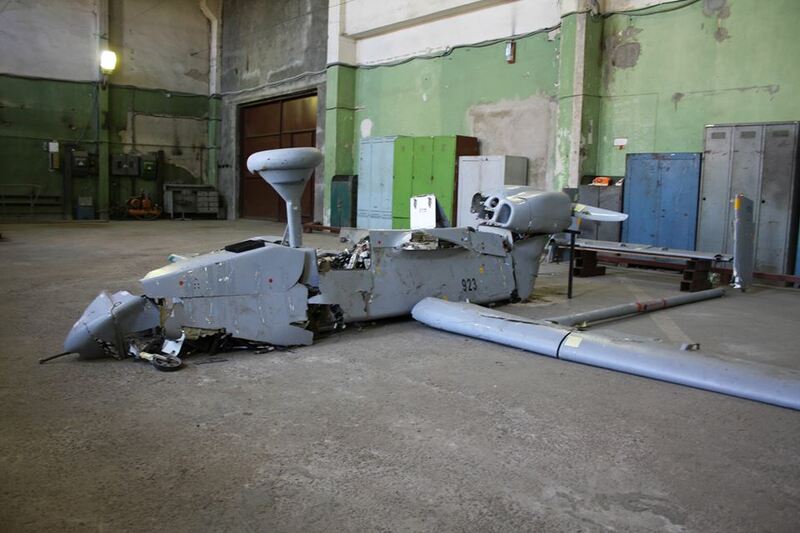 In the last 12 months of resistance to Russian occupation of Donbass this is the 2nd UAV that was shot down. This UAV can observe enemy positions and it can also coordinate artillery fire in real time. The FORPOST UAV is actually Searcher Mk II UAV designed and manufactured by Israel Aerospace Industries (IAI). 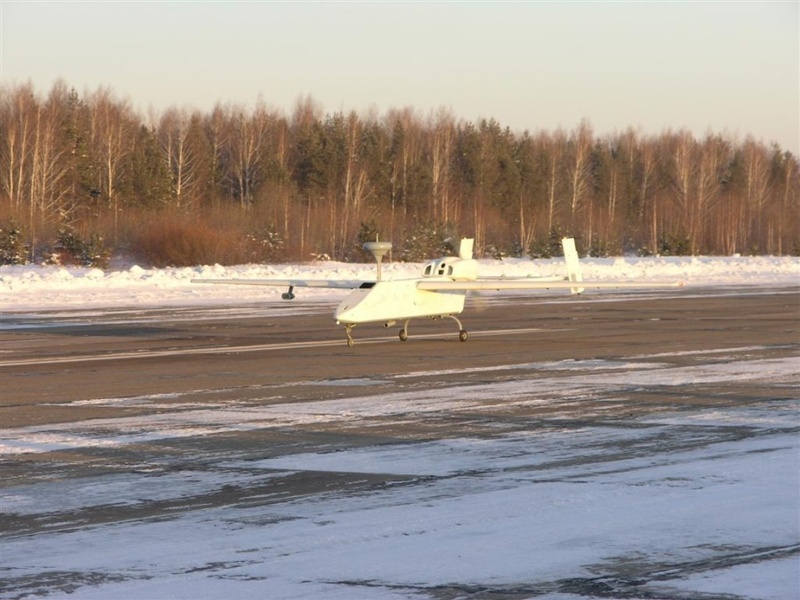 On October 12 2012 they signed contract with “Oboronprom” to start production of that type of UAV in Russian Federation. In the presence of the Minister of Industry and Trade of Russia, Mr. Viktor Khristenko, Israel Aerospace Industries (IAI) CEO, Mr. Itzhak Nissan, and the Director-General of the Oboronprom Russian Industrial Corporation, Mr. Andrey Reus, signed an agreement yesterday afternoon, 12 October 2010, to sell UAV assembly elements and services to Oboronprom. 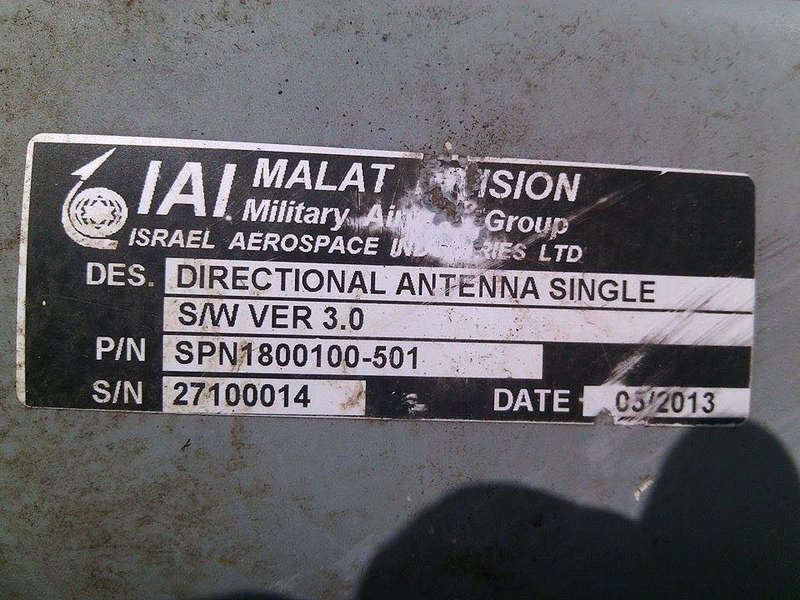 See details posted by Israel Aerospace Industries (IAI) here. 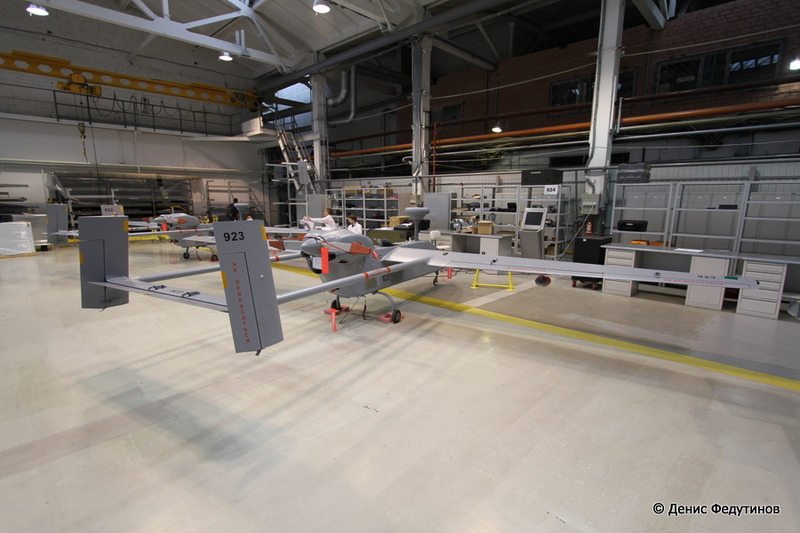 Ironically, the photos of the same FORPOST (IAI Searcher Mk II) UAV were posted on November 11 2013 by Denis Fedutinov from the Russian factory where it was just manufactured. See original post here http://bmpd.livejournal.com/658798.html As you can see from the number 923 this is the same UAV. 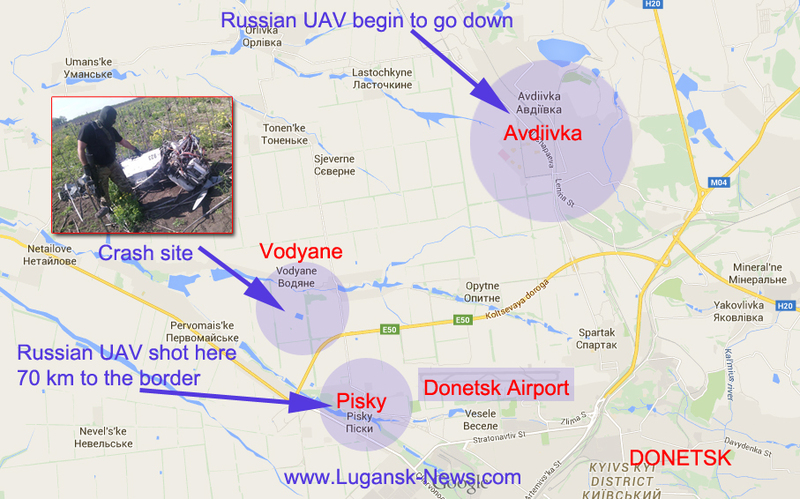 According to Markian Lubkivskyi Russian UAV got hit in the area of Pisky (controlled by Ukrainian Army) and it started to go down in the area of Avdiivka and crashed North from Vodyane. Avdiivka and Vodyane are also controlled by Ukrainian Army. 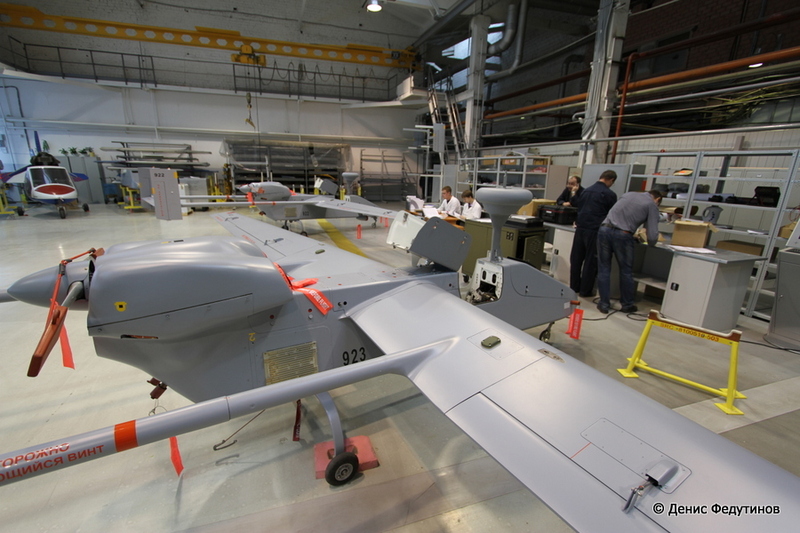 Markian Lubkivskyi also said that Russia manufactured only 10 UAV FORPOST during 2011-2013 and the approximate price of the head optics with infrared camera is about 1 million US dollars. 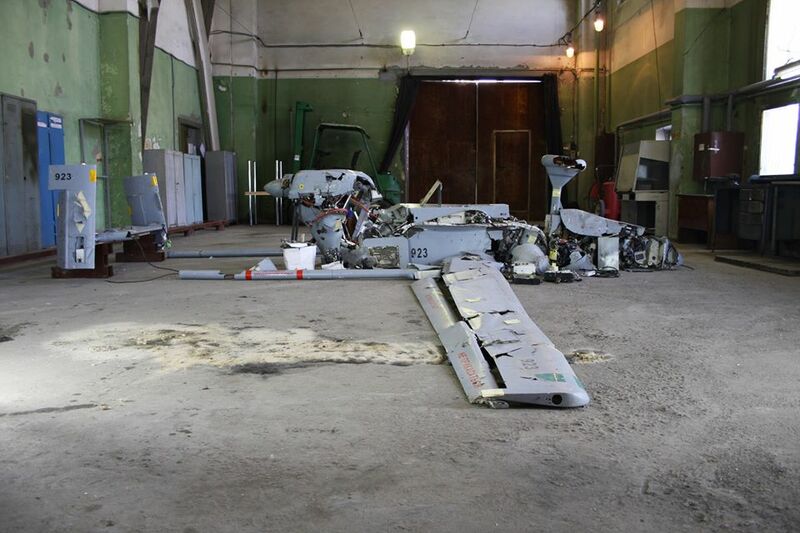 Markian Lubkivskyi also posted additional photos of the UAV. “I am a soldier of Russian Federation”. Full translation of the video of Russian POW published by Ukrainian soldier. 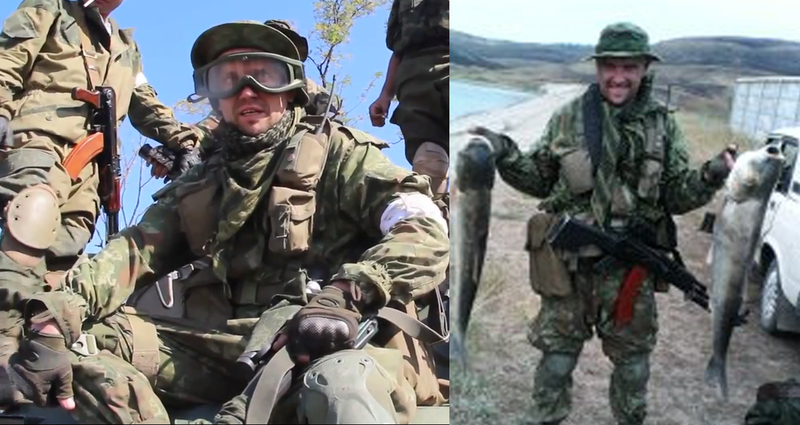 Yesterday Ukrainian soldier Leonid Maslov (here is his Facebook page) posted a video of Russian Special Forces soldier who was captured in Ukraine near Shchastya town located about 20 km from Lugansk city on May 16 2015. Below is the original video and full translation of the conversation between 2 Ukrainian soldiers and Russian POW Aleksandr Aleksandrov. Ukrainian soldier #1: Your last name, first name, patronymic name? Russian POW: Aleksandrov Aleksandr Anatolievich. Ukrainian soldier #1: Military rank? Ukrainian soldier #1: Go on, city? Ukrainian soldier #2: 3rd Brigade of Special Forces? Ukrainian soldier #2: Say it loud. 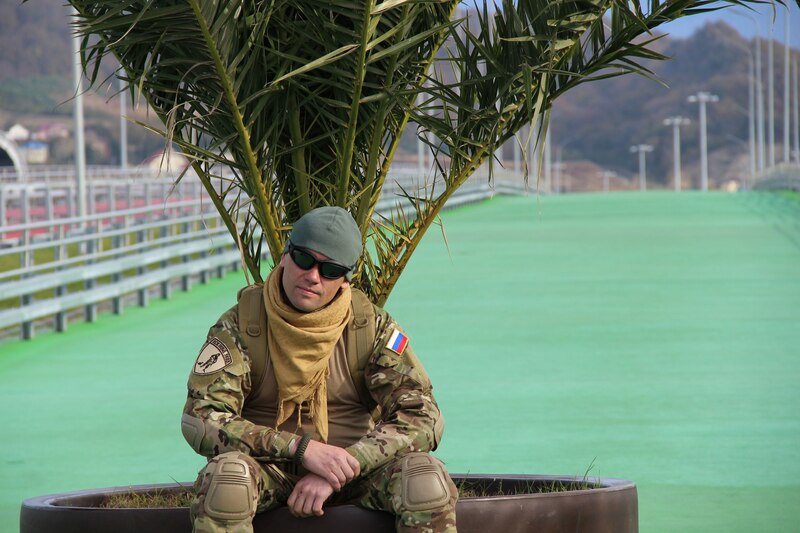 Russian POW: 3rd Brigade of Special Forces, Togliatti city. Ukrainian soldier #1: Starting from what date you are in the “zone” (means Anti-Terrorist Operation zone)? Russian POW: Since March 26. Ukrainian soldier #1: Last name of your commander? Russian POW: Yarofeev Yevgeniy Vladimirovich. Ukrainian soldier #1: What area you worked in? Russian POW: Area of Shchastya, city of Shchastya. Ukrainian soldier #1: Group structure? Number of people? Ukrainian soldier #1: Last names? Ukrainian soldier #1: Military rank and last name? Ukrainian soldier #2: Tasks and under what circumstances you were captured? Ukrainian soldier #1: Think, think, concentrate, remember. 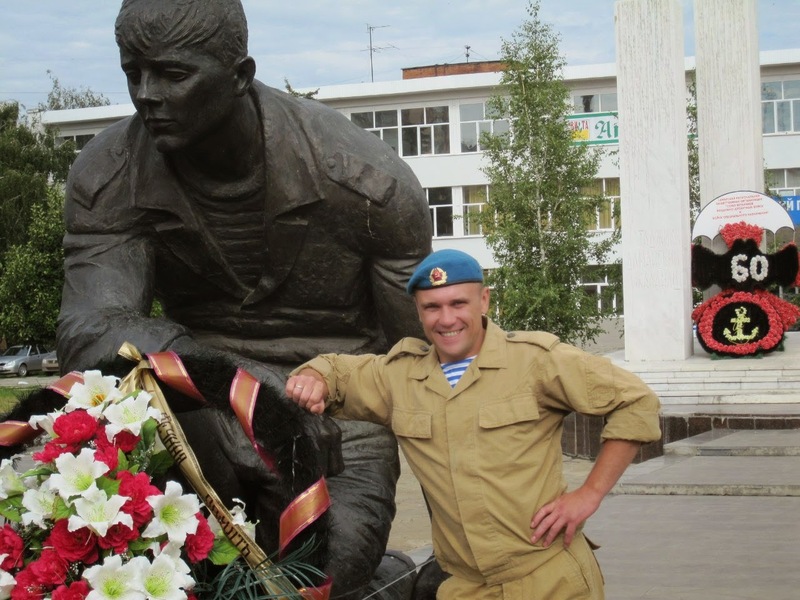 Russian POW: Yefreitor Kutul-Akhmetov (“yefreitor” is a rank in the Russian military). Machine gunner, yefreitor Konovalov, senior gunner. Sniper, junior sergeant Nemov. Ukrainian soldier #2: Callsigns? You know everybody communicate to each other by callsigns. Ukrainian soldier #1: He is naming the group now (addressing to Ukrainian soldier #2 who interferes into conversation). Name the group till the end (addressing to Russian POW). Russian POW: Scout…(couple of words not clear) Grigoriev, sergeant Grigoriev. Ukrainian soldier #1: uh huh… (meaning “Yeah”). Russian POW: Sapper, yefreitor Spiridonov. Commander of 2nd squad, senior sergeant Yevlaev. Sniper, Kulmukhametov, yefreitor. Ukrainian soldier #2: Sasha (Sasha is short for Aleksandr in Russian), has physical force been used towards you? Ukrainian soldier #2: No. Say this directly. Russian POW: Physical force hasn’t been used towards me. Ukrainian soldier #2: You are a soldier of Russian Federation or you are transferred to the reserve? Russian POW: I am a soldier of Russian Federation. Ukrainian soldier #1: You are on military service, starting from what date you are on military service? Russian POW: Starting from December 12, 2012. Ukrainian soldier #2: You are contract soldier now, yes? 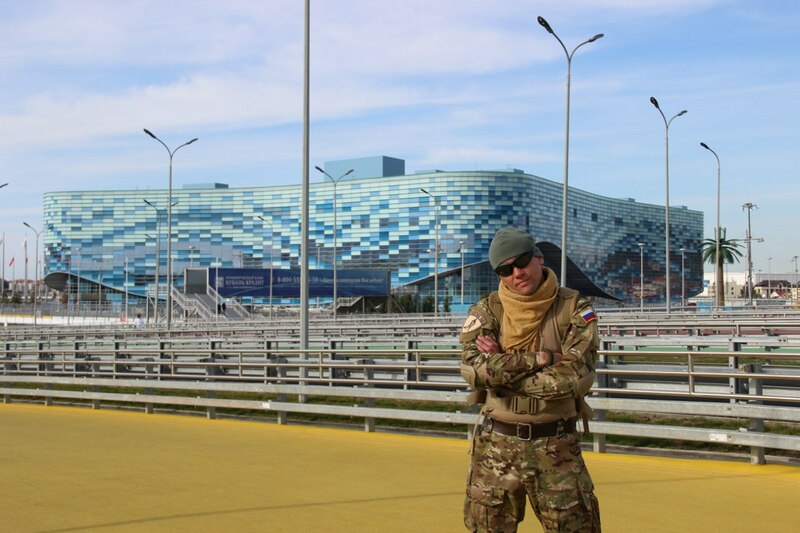 Russian POW: Yes, I am a contract soldier. Ukrainian soldier #2: What is the motto of special forces, the motto of your regiment? Russian POW: At any time, in any place – any task. Ukrainian soldier #1: Clear. Number of groups that you know that work in this area? Ukrainian soldier #2: Those that consist of servicemen of Russian Federation. Ukrainian soldier #1: How many men, how many groups work in the area of Shchastya? Russian POW: In the area of Shchastya we rotate with one group all the time. Ukrainian soldier #1: Are there some other groups working in this area? Russian POW: In the neighbor areas. Ukrainian soldier #1: In what neighbor areas? Russian POW: Stanytsia Luhanska area. Russian POW: I don’t know more, I don’t know other groups. Ukrainian soldier #1: You don’t know their tasks? Ukrainian soldier #2: Your tasks? Ukrainian soldier #1: What orders were you getting from your command, orders the group got when moved forward? Russian POW: Get to the point… (the rest is not clear). Ukrainian soldier #2: Under what circumstances you were wounded? What is the task of your group? Ukrainian soldier #2: Say louder, please. Russian POW: Get to the bridge and make observation. Ukrainian soldier #1: Next. What happened? Russian POW: … (phrase not clear)… we were detected… when we were retreating I was wounded in the leg. 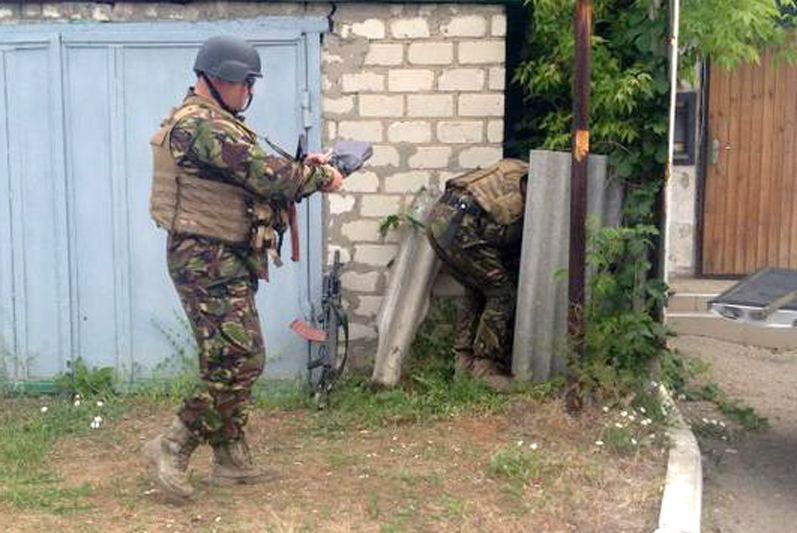 Ukrainian soldier #2: Did you cross the territory…? Ukrainian soldier #1: Did you cross the territory that borders? Russian POW: No, we didn’t cross the river. (Means Siverskiy Donets River, the demarcation line between territory controlled by so-called Lugansk People’s Republic and Ukraine controlled territory). Ukrainian soldier #2: You task was observation? Or no? Ok, we won’t prompt you, tell us clearly your task, your group movement. Ukrainian soldier #1: Group members, how many men? Ukrainian soldier #1: 14 men. For what period of time you come here, you rotate, or you are permanently deployed here? Russian POW: For 4-5 days. Ukrainian soldier #1: After that you depart to you permanent place of deployment? Russian POW: Yes, to Lugansk city. 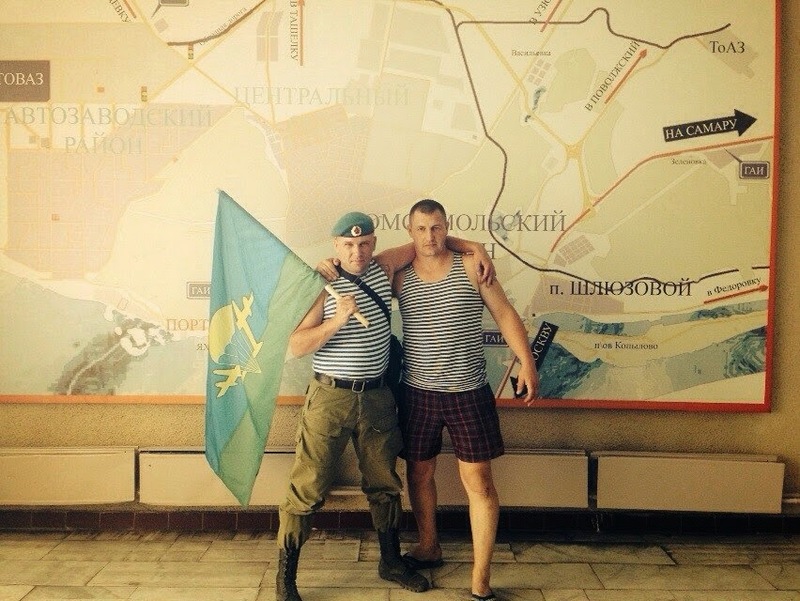 Ukrainian soldier #2: Lugansk city… How did you get to Lugansk city initially? Ukrainian soldier #1: You are located here, you arrive on vehicles? 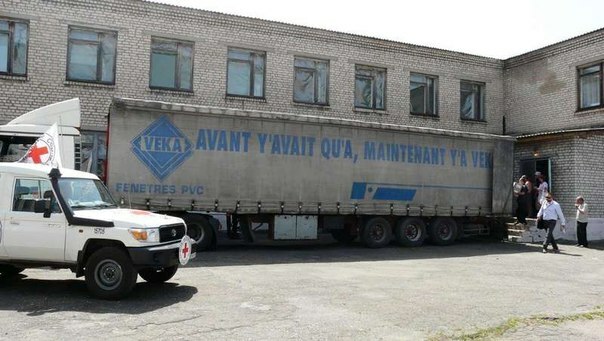 Russian POW: Yes, we arrive on vehicles. 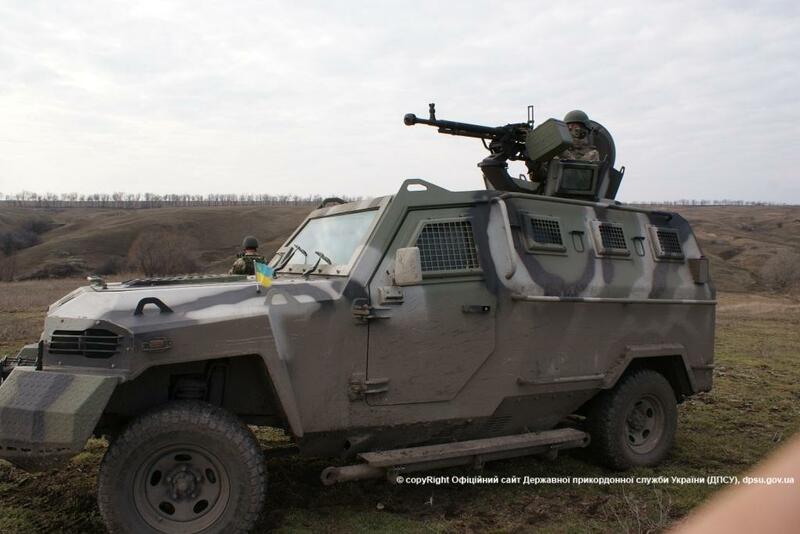 Ukrainian soldier #1: What kind of vehicles? 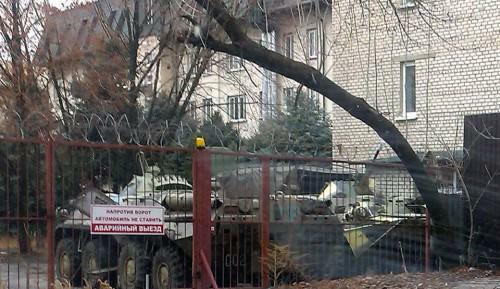 Ukrainian soldier #2: Armored vehicles like BMD, BMP? Russian POW: Only on “URAL” truck. 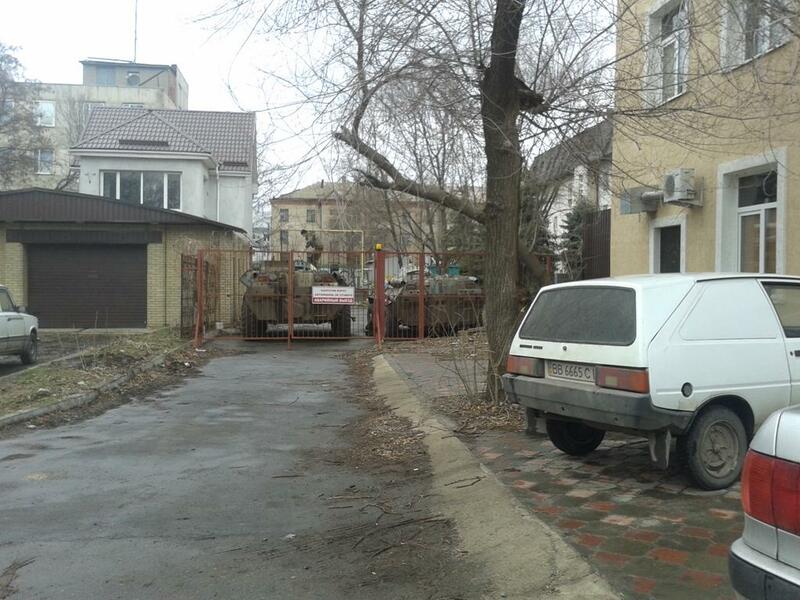 Ukrainian soldier #2: Who comes with armored vehicles? 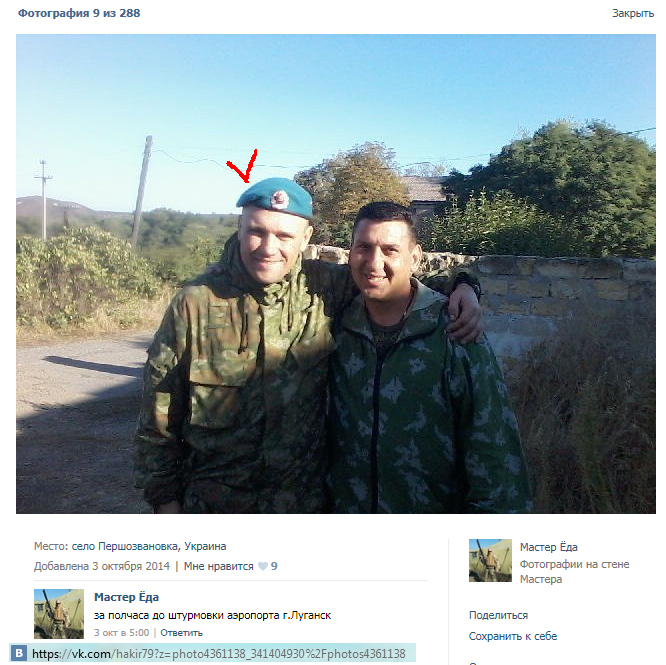 Ukrainian soldier #1: Last name of commander of your brigade? Ukrainian soldier #1: Say his military rank and last name. 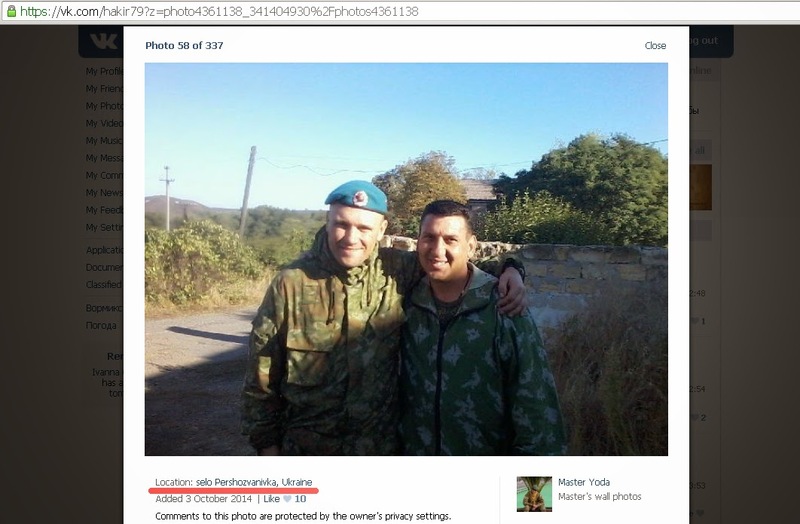 Ukrainian soldier #1: Company commander? Ukrainian soldier #1: Permanent brigade deployment location? Ukrainian soldier #2: Can you say it again louder? Ukrainian soldier #2: How do you communicate with local population on that side of the river? Ukrainian soldier #2: Get information? Russian POW: We don’t get information. We ask militia. Ukrainian soldier #2: How do you communicate with so-called militia? Ukrainian soldier #2: Joint operations? Russian POW: No joint operations. Ukrainian soldier #2: You have an order not to get in contact with them or what? Russian POW: No, we communicate, but no joint operations, don’t discuss tasks. Ukrainian soldier #1: So units are working without co-operation, autonomously, correct? Ukrainian soldier #1: Number of groups that you know that work based in Lugansk city. Ukrainian soldier #1: 6-8 groups. Who do you know from other groups? Last names? Russian POW: …(thinking, not clear what he says, can’t say last names). Russian POW: Sergeant…(name is not clear), sergeant Aleksandrov. Ukrainian soldier #1: Also sergeant Aleksandrov? He also works in a separate group? 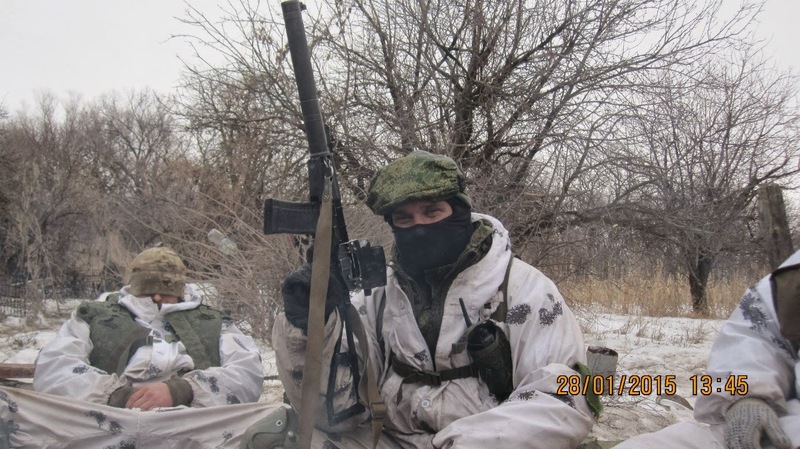 Russian POW: Yes… squad commander. Ukrainian soldier #1: Where does that group work… now? Russian POW: He is located in Lugansk city now. Ukrainian soldier #1: And where did he work? Ukraine border guard patrol attacked by saboteurs who retreat to Russia. Border Guard Service of Ukraine posted a message on their website today that their border guard unit was attacked by unknown people while patrolling the area 200 meters from Russian border. After the fight armed men retreat to Russia. One border guard was wounded. Below we translated the information from Border Guard Service, the original report in Ukrainian is here. Yesterday border guard patrol of Stanytsia Luhanska got in a fight with a group of unidentified armed men. The border guard unit was monitoring the State Border in the direction of Mozhaevka (Russian Federation) and Harasymivka (Ukraine). 200 meters from the State Border they saw unknown person. When border guards tried to follow that person in order to stop, 100 meters from the State Border they saw several people dressed in camouflage who opened fire when they saw border guards. The fight started. As a result of border guards well coordinated actions the saboteur group had to retreat. Terrorists who attempted to make diversion retreated to the territory of Russian Federation. 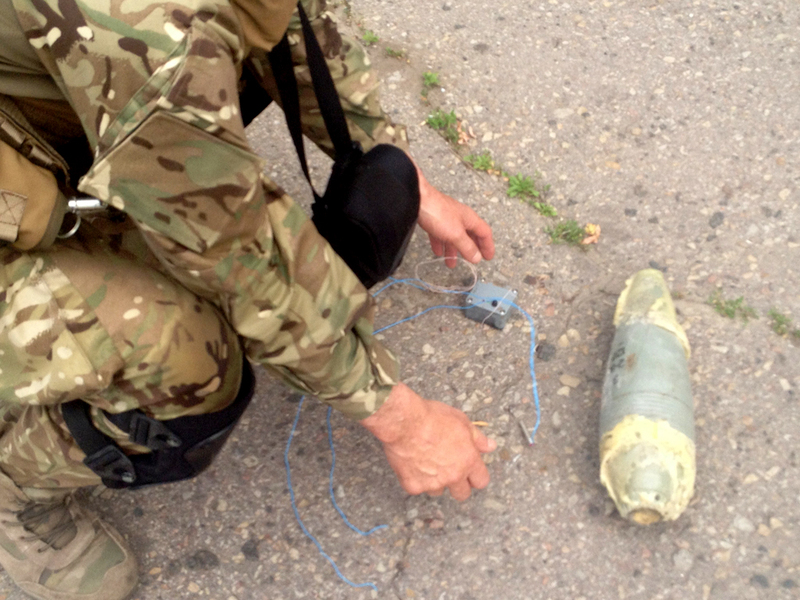 One border guard got shrapnel wounds when one of the saboteur threw a grenade that exploded. We analyzed this information and put some marks on the map. As you can see the positions of so-called Lugansk People’s Republic are at least 23 km away from the location where the fight took place. So if those men were from LPR group, they would have to walk that distance off-road close to the border hiding from Ukrainian and Russian border guard patrols. But we know that terrorists retreated to Russian Federation, so they were sure they were going to be safe there and most likely they actually arrived from Russia. As you can see there is a road to Russian town Mozhaevka going inside Russian territory, terrorist could use that road to get to the location from their base located in Russia.